My intention is to make you squeal with joy. We're living in a time filled with sensationalized headlines on our screens and stomach-churning dread in our feeds. Instead of creating art to reflect or comment on the Big Bad, I choose to make beautiful things as an antidote to the ugliness. Soft sculpture engages more than the eye. It tempts one to touch. My intent is to slow you down, give pause for a breath and remind you that joy is possible. Born and raised in Nashville, Tennessee, Shana Kohnstamm has always embraced the unusual way she sees the world. Myopic since early childhood, her ability to see forms and faces in “the blur” gave her an innate understanding of color and shading long before developing the skills needed for drawing and painting. Departing from her formal arts education, Shana explored a variety of creative careers, including stained glass design and fabrication, bead and jewelry making, theatrical painting and even briefly apprenticed as an ocularist before turning her attention once again to fine art making. 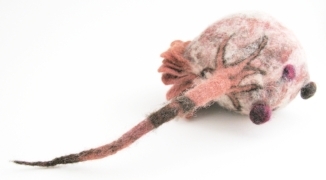 In 2010, Shana attended a wet-felting workshop that ignited a passion for making beautiful, strange and technically complex wool sculptures. Since then, her work has been featured in fiber arts magazines, juried and invitational exhibitions and has garnered several awards in regional art exhibitions. 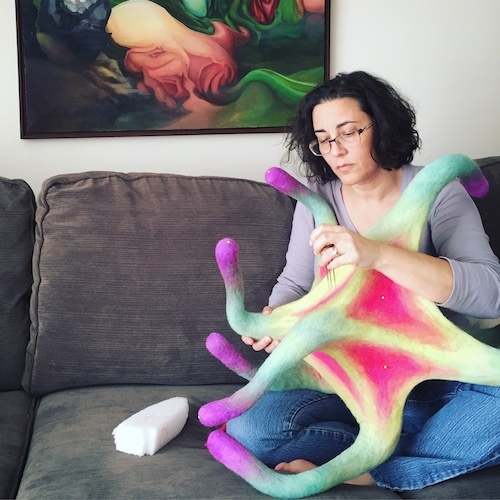 Her love of the craft was actualized in October 2015 when, as curator, Shana hosted the critically acclaimed international soft sculpture exhibit "Touched" in Nashville, Tennessee. Artists From Near and Far Herald a New Season with ‘Nexus 2013'. Metropulse.